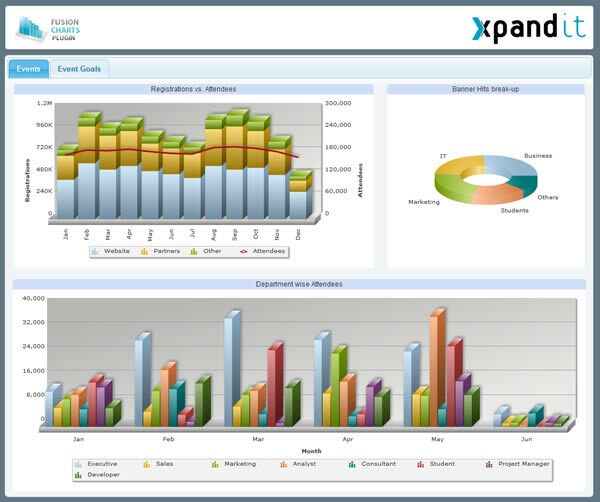 FusionCharts can now be easily integrated in Pentaho BI dashboards with a plugin developed by Xpand IT. The plugin brings the wow factor of FusionCharts to the popular open source BI suite, and can be used to display eye catching charts on the user console and dashboards. And the best part of it – the plugin is free and open source! The Pentaho BI Suite already has different chart libraries like Open Flash Chart and JFreeChart. With FusionCharts entering the picture, you have an alternative that not only provides a way to have more stunning charts but also is more comprehensive, robust and flexible. FusionCharts supports a wider range of chart types and widgets, and allows many more customization options for your chart. Also, with smart number formatting capabilities, the data is represented in a much cleaner way. The plugin supports both the ways of creating dashboards in Pentaho BI Suite – using Dashboard Designer Enterprise Edition and the Community Dashboard Framework. The installation is quite easy and the usage is the same as the other chart libraries. So you don’t need to spend a lot time learning a new technology. Finally, the plugin supports both FusionCharts Free (which is also open source) and FusionCharts v3, so you can pick what you want. The plugin has been released on ﻿Google Code as an open source project. You can simply download it as a user, and if you feel like it, you can dive into the code and see how it works in detail as well. In the future, Xpand IT plans to extend the support to all charts, widgets and maps and a standalone version might be developed that won’t need the installation of the whole Pentaho platform. For more information, head to the Pentaho FusionCharts plugin page. I didn’t find the fusionchart component in Pentaho Component Menu. Is thas a new way to get more click ? Previous post: The Internet’s funny way of being, err, funny!